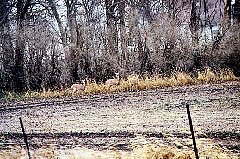 I hunted by myself in Northern Iowa on Wednesday, November 1st, 2000. I should have paid more attention to the weather forecast. The day before had been unseasonably warm (70 degrees) and clear. So I decided to drive down. Today was still warm (60 degrees) but it started to rain soon after I took this first picture. 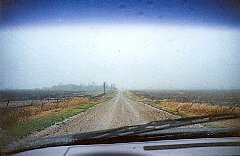 A rooster ran full speed across the road in front of me. You can see from my tire tracks where I pulled over to try and flush him. He ran in just ahead of the field drive. He must have kept on running, because I couldn't flush him out of this ditch. It's drizzling now. Here is an interesting barn. What's that metal tower sprouting from the roof? A windmill? 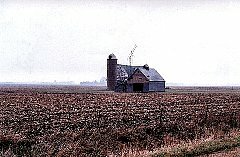 I noticed that a characteristic of farms in this part of Iowa are outbuildings far from the farmhouse. 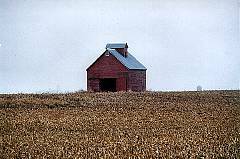 Sometimes, way out in the middle of the section, there will be a lonely corn crib or barn. I don't recall seeing much of this is Minnesota. I guess most of these buildings were put up in the 30's and 40's. Just a guess. Enlarge this picture and look at the rain. I am not happy when I took this picture. I don't want to get out of the car in heavy rain, or else I won't be dry again all day. I did spot two roosters under some pine trees near the road. I got out, but they ran across an abandoned farmyard and ran/flew off to God knows where. 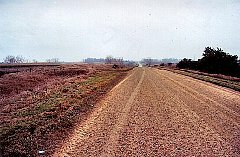 Pheasants have a rehearsed escape route from areas they frequent. This pair may slip away from hunters dozens of times before the season ends. I tried to take a picture of where they were under the pines, but messed it up somehow. Now I am wet from my short walk outside. Looks like a recent fire. 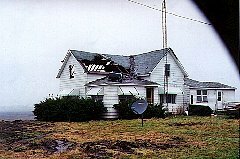 Note the bathtub on the roof. 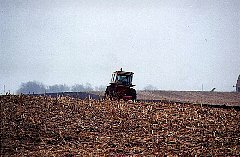 Here is a farmer plowing in the rain. It ended up raining for a good four hours. This time of year, when the weather's bad the farmers head to town for coffee. I stopped in a little town and caught up with one near a gas station. He told me the forecast was for 4 hours of rain. He also told me what direction the rain was moving. I decided to jump in the car and drive until I got out from under the rain. I drove for about an hour to do so. About sixty miles down the road, the rain has ended. 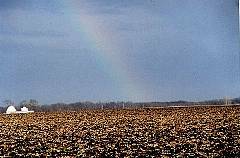 It will be hard to walk the edge of any cover near a plowed corn field. 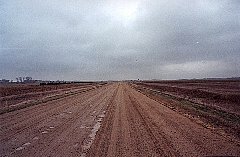 The soil gets so sticky it makes walking impossible. My back is killing me. I've been cooped up in the car all morning. I need to find a place to get out and walk. I kind of like the low angry clouds, it was the rain that made things unpleasant. I walked this large tract of land. Look where the line of pine trees has a break in it way in the background. I walked back to there, then followed along the pine trees back to the road. I flushed three hens on my walk. Pretty good to get something to flush, considering I don't have a dog. 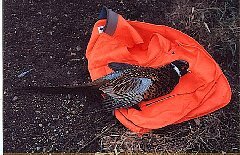 I don't mind just getting out and walking; finding pheasants is a bonus. Here is where I got a rooster. 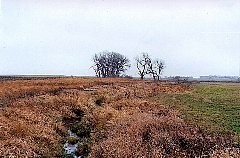 I walked out around the left side of the cottonwood trees and turned right along the drainage ditch. It extended a long way to the right, which is not easy to get a sense of from this picture. I walked a good half mile almost to the end of the ditch. Coming back, I stood for a while under the cottonwoods. The wind was steady and forceful and caused the the bare cottonwood branches to make an eerie low growling noise. I started back to the car and wasn't too far from the trees when a pheasant jumped up. He jumped sideways to me, so got a good look and could tell immediately he was a rooster and not a hen. I fired once and missed him. I dropped my aim and got him with my second shot. He crumpled up so I knew he wouldn't be running. I marked a tree ahead of me and a bare tree trunk behind me and set off to find him. I thought he almost made it to a plowed field to the left side of the cottonwoods in the picture above. I looked and looked for 30 minutes. I did find one tail feather on the edge of the plowed field. I unloaded my gun and kept going back and forth sweeping weeds away. I was afraid he had burrowed into the tall grass. Finally, back on the edge of the field near where I found the tail feather, in plain sight, I found him. Here are some deer near a farm. 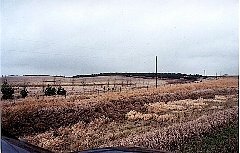 Farms usually have lots of trees near the house and barn to form windbreaks for protection from drifting snow in the winter. Often you see pheasants or deer when looking along these lines of trees. In many cases, the protection they afford gives wildlife a place to survive the winter. 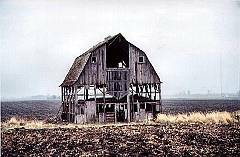 Here is an old barn that has seen better days. What's a storm without a rainbow? Here is another barn out in the middle of the section. I had a good time today, notwithstanding the rain.